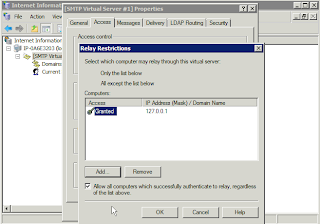 I ran into a problem today on Windows Server 2008 where mail wasn't being sent from CF through IIS SMTP running on the same machine. The CF Administrator indicated that CF could connect well enough, but nothing was being sent. Whenever I run into something like this, the first thing I try is a telnet session from the console. This lets me see the responses directly from the SMTP session. So, I went to a command prompt and typed "telnet." I was a bit surprised to find that telnet is no longer available by default, and you have to explicitly enable it as a Windows feature using the "Turn Windows Features on and off" option in Control Panel. I kind of like that - most people don't use telnet and it's a potential minor security issue - but I found it disconcerting for a minute. 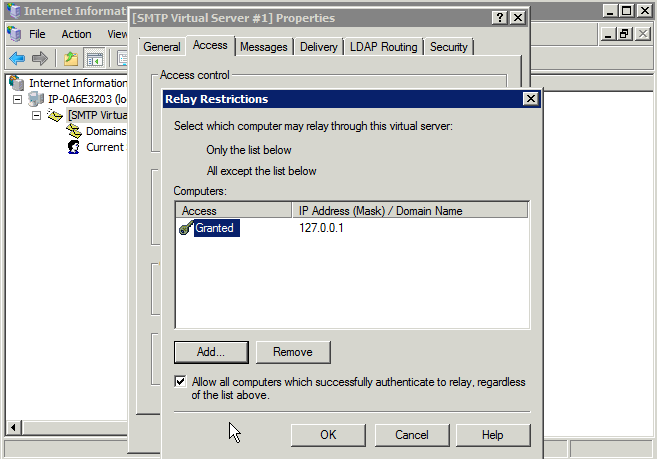 Fortunately, there are plenty of instructions on how to enable telnet in Windows Server 2008.
then tried to send an email, and had my suspicion confirmed: relaying was disabled. and I was all set! The moral of the story is, I guess, telnet is your friend.